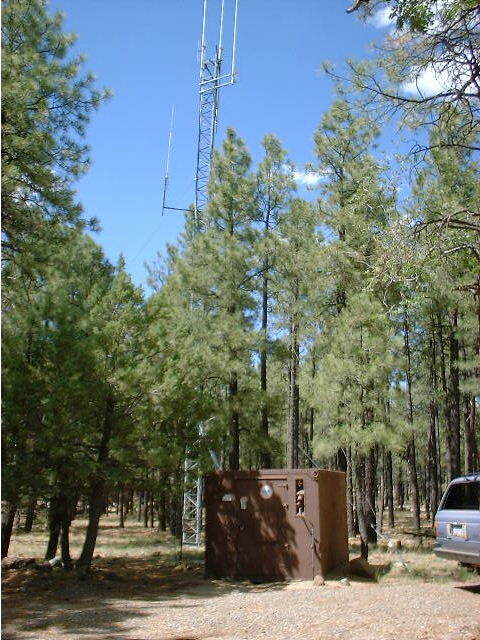 The Verde Valley Amateur Radio Association owns and operates this state of the art two-meter repeater W7EI, atop Mingus Mountain on the frequency of 147.220 Mhz (+600)(162.2 tone), and is an open repeater and may be used by any licensed Amateur Radio Operator. The repeater covers the Verde Valley including Sedona, Prescott, Ash Fork, Flagstaff, and Phoenix. The repeater provides everyday communications and urgent traffic during Emergencies and Search and Rescue operations. A Courtesy tone of "One Beep" is used on the repeater if you key before the "Beep" the repeater could time out. Please use standard repeater etiquette. Autopatch is not available on this repeater. After viewing larger picture please use the browser back-button to return to this page. APS W7EI repeater power project consisted of pulling all of the power cable and terminating the underground connections etc. It was a good team effort by the crew Mike Wingate WA6LSE (SK), Bob Thompson KC8BOB, Pete Morrison K6VVR, Tim Henriksen KF7GCO and Bob Rosevear WB7RRQ to give the club clean reliable APS power. 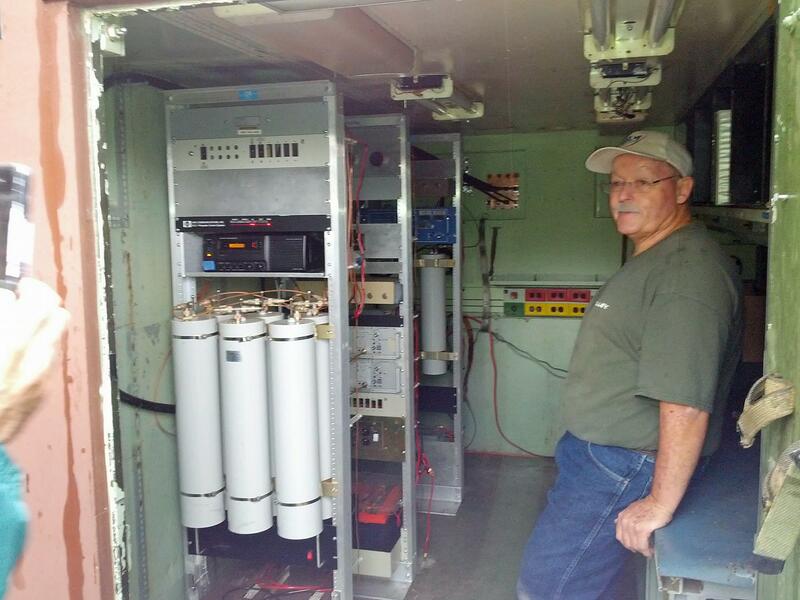 The VVARA Club owns and operates this state of the art two-meter repeater W7EI, atop Mingus Mountain on the frequency of 147.220 Mhz (+600)(162.2 tone), and is an open repeater and may be used by any licensed Amateur Radio Operator. The repeater covers the Verde Valley including Sedona, Prescott, Ash Fork, Flagstaff, and Phoenix. 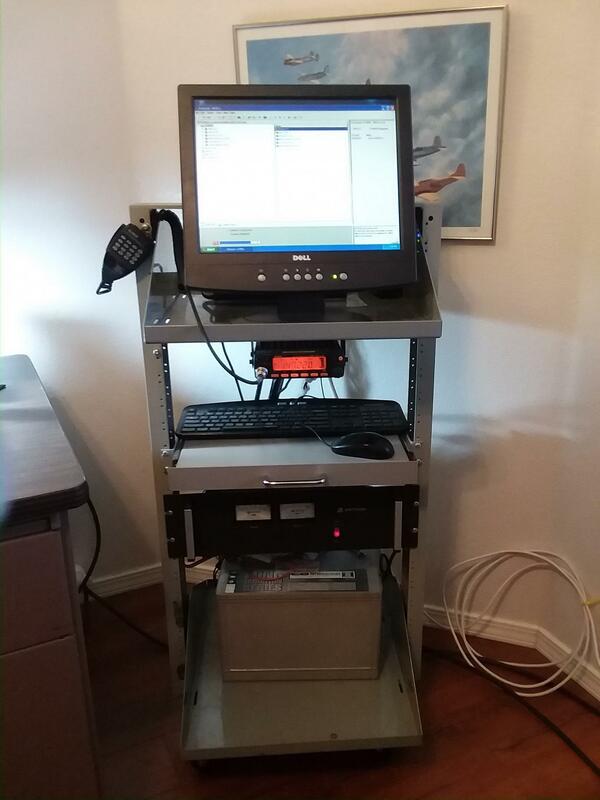 The repeater provides everyday communications and urgent traffic during Emergencies and Search and Rescue operations. A Courtesy tone of "One Beep" is used on the repeater if you key before the "Beep" the repeater could time out. Please use standard repeater etiquette. Autopatch is not available on this repeater. There is more to setting up the W7EI-L EchoLink system than just making the system look pretty. Steve Pearson KC7TIL has did allot on the EchoLink system to everything more organized including running everything on 12 volts DC including the modem/router with a huge back up battery (bottom of the rack). The system draws about 2 amps on standby and about 4 amps on transmit. The back up battery is rated at 90 amp hours so it should run the system for about 36 hours easy. The Astron power supply was in club inventory for years but someone had shorted it out and Jim Beck KJ7NW was able to repair it and it has an automatic switch over circuit to go to the battery in the event of an APS power outage. The Astron is rated at 20 amps (16 amps continuous) with a built in float charger to keep the back up battery charged. The rack was donated by Matt Dutton N7YIO along with the back up battery, he also found four other commercial batteries at work in the scrap heap, which were still rated at 85%+ capacity so the club has ZERO cash outlay for the two back up batteries on the 147.220 repeater on Mingus, the W7EI-L EchoLink resides at Steve KC7TIL's residence, the 220 repeater Rod Rosenbarger KI6FH maintains is in the VVARA building on Mingus as well as one for Bob Smith WB6ODR's Backup EchoLink WB6ODR-L also. Of course allot of credit is due Jack Crabtree W7JLC for getting things started in the first place. All club members wanting to use Echolink should email their reqest to be added to the approved list. Any non-members wanting to use Echolink are handled on a case-by-case basis. The Verde Valley Amateur Radio Association board of directors may, approve non-members wanting to use Echolink. Right Click on View and select "Save Target As..." to Download the PDF file. L = Linked to another radio or radios. File one application for each transmitter. Listings prefaced with a * are pending coordinations. This website is hosted and maintained by the Verde Valley Amateur Radio Association (VVARA). This website provides information and links relating to amateur radio, club activities, severe weather and emergency preparedness. VVARA makes no warranties or representations, either express or implied, with respect to the accuracy or completeness of the contents of this website. Information may be changed or updated without notice and may contain technical inaccuracies or typographical errors. VVARA shall not be liable for damages of any kind arising out of or in connection with the use of these websites. Copyright © 1976-2018 Verde Valley Amateur Radio Association, All Rights Reserved.